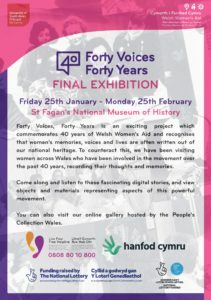 Today, Welsh Women’s Aid launches the Forty Voices, Forty Years final exhibition, which recalls and celebrates the significant change created by women in Welsh society since 1978, when the movement was founded to challenge and prevent domestic abuse in Wales. A year of activities and events has culminated in this exhibition, which profiles the memories and stories from women involved in the movement in Wales, who have been responsible for placing domestic abuse and all forms of violence against women on the public, political and social agendas. The exhibition includes a collection of 40 oral histories in the form of digital stories, an exhibition of photos and objects from the movement’s past, and a timeline of major events for the movement over the past 40 years. It runs for a month, from St Dwynwen’s Day (January 25) at St Fagans Museum of Welsh History and will be launched at an exclusive preview on Thursday evening, 24 January at 6pm. Forty Voices, Forty Years is a heritage project led by Welsh Women’s Aid in collaboration with the George Ewart Evans Centre for Storytelling at the University of South Wales, and funded by Heritage Lottery Fund, the Big Lottery Fund’s National Lottery Awards for All, and Hanfod Cymru. After the exhibition, the materials will go on to form an archive at the National Library of Wales, and be made available online and through the People’s Collection Wales.